Diet advice is everywhere and bold claims like “reduced sugar” or “all natural” catch your eye on food packages everywhere. However, before you take hold of a box of that "New and Improved" breakfast cereal, take a look at these tips to help you pick a healthy cereal for you. Experts from The American Dietetic Association reviewed the leading cereals, including these reduced sugar versions, only to discover that the calorie amount was equal to the regular high-sugar variety. In fact the only one that had somewhat fewer calories was General Mills Cinnamon Toast Crunch—and it only dropped by 10 calories in each serving. Well, the manufacturers replaced the sugar with other forms of refined carbohydrates. So the manufacturers are legal in their marketing of “reduced sugar”, but the calorie amount is virtually the same. Check out the nutrition labels the next time you are in the grocery store. 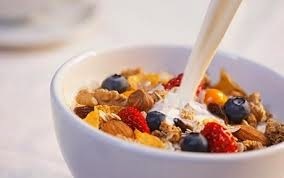 For a fiber-rich cereal reach for oatmeal, Cheerios, Wheaties, shredded wheat, raisin bran or Kashi. Add sweetness with fruit, honey, or agave nectar. Give sliced bananas, frozen blueberries, or fresh strawberries a try. Top it all off with some low-fat milk, soymilk, or almond milk. I’ve even added Greek yogurt to create a parfait-like treat. If you or your loved ones are screaming for the sweeter stuff, first try to go half-and-half. For example, half chocolate puffs mixed with half Cheerios. The amount of sugar and flavorings is more than ample to sweeten the contents in the entire bowl. Remember the "Rule of Fives": Choose cereals with at least 5 grams of fiber per serving, and less than 5 grams of sugar. Look for each serving to contain at least 3 grams of protein. Read the ingredients list. Avoid cereals that list hydrogenated oils, artificial dyes or colors, and chemical preservatives. Schwartz, M., Vartianian, L., Wharton, C., Brownell, K. (2008). Examining the nutritional quality of breakfast cereals marketed to children. Journal of The American Dietetics Association. 108(4), 702-705.